Shopping for souvenirs when you travel abroad doesn’t have to be time-consuming or expensive. Whether you need to buy a few gifts for those back home or just want to pick up something unique for yourself, you can buy everything you need at the local supermarket. Supermarket goods are priced for locals, not tourists– so you’ll get the best price, sometimes for the exact items you you’ll find at a gift shop. Since most supermarket items are consumable, you don’t need to worry about them becoming dust collectors back home. Supermarket items are pre-packaged and easy to toss in your suitcase. Browsing a local supermarket gives you a break from the tourist sites and lets you join the locals in their day-to-day activities. 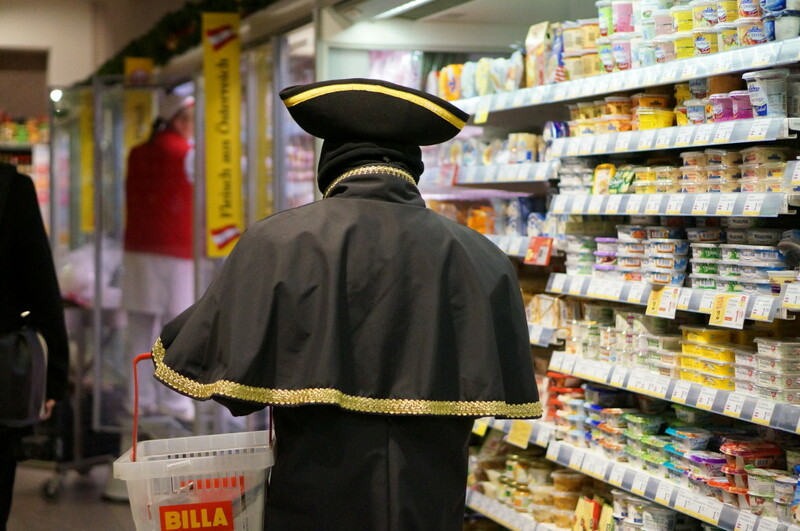 Even your tour guide hits the local supermarket. 10. When in doubt, ask a local. You don’t need to visit a fancy gourmet shop to find gift-worthy jams and honey– you’ll find plenty of great options at the regular supermarket, for a fraction of the price. 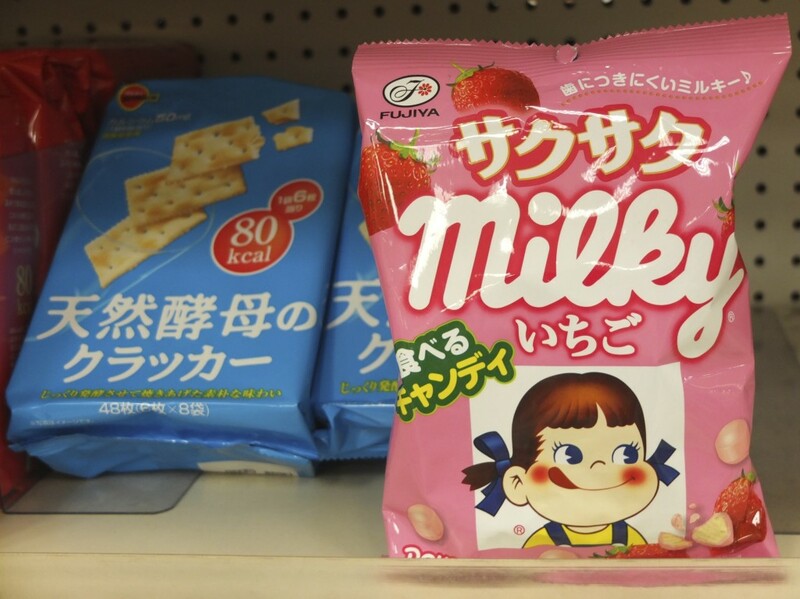 You can usually decipher the flavor by the pictures on the label. Back home, wrap a little cellophane around your jars and finish with a pretty ribbon for easy gifting. In Europe, condiments are often packaged in colorful squeeze tubes. 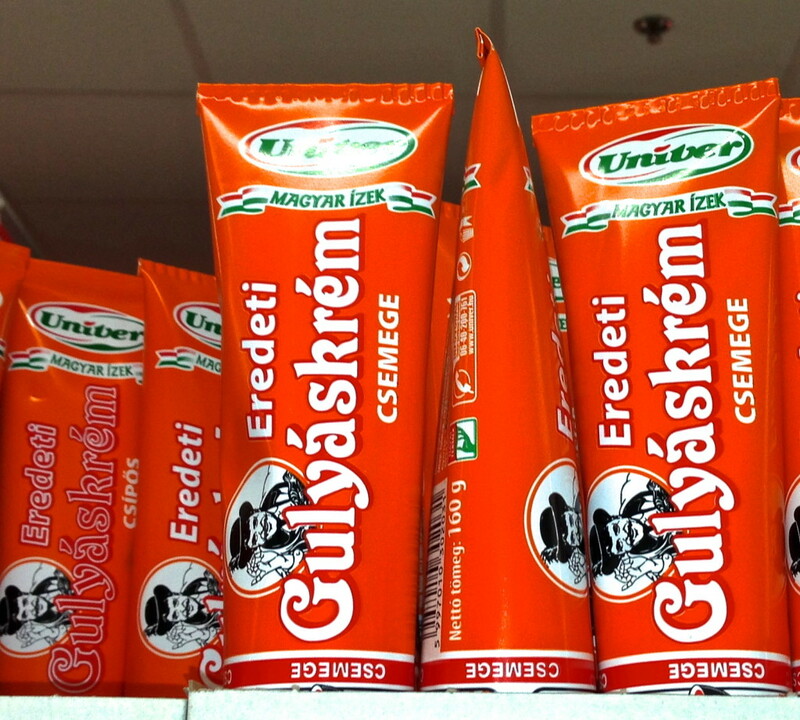 Be adventurous and try a local specialty like Hungarian goulash paste (great on a sandwich). 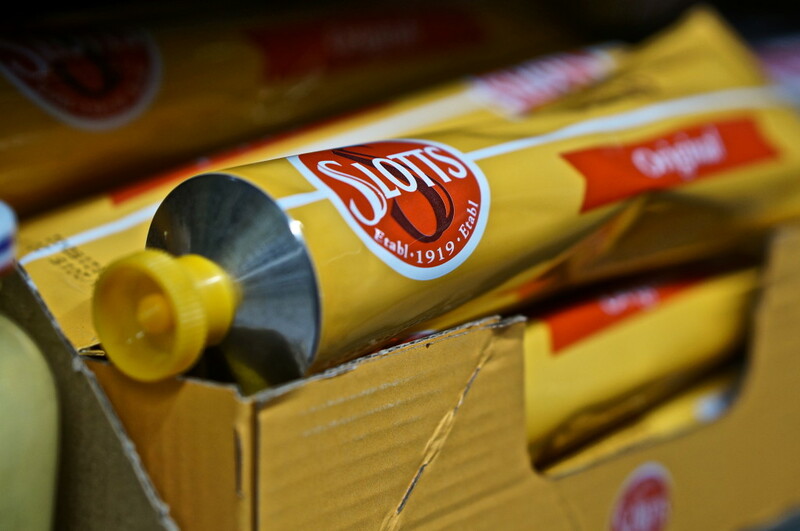 Or stick with something more conventional like the favorite local mustard brand– in Sweden I discovered Slott’s mustard, a Swedish favorite for nearly a hundred years. When hitting the candy aisle, don’t be afraid to scoop up a variety of options (they’re cheap after all) and wait until you get back home to taste test them all. You might get some duds (I really should have learned the Icelandic word for licorice before buying a dozen chocolate-covered lakkrís bars) but it’s all part of the experience. The cookies you’ll find abroad aren’t loaded up with high fructose corn syrup and hydrogenated oils, so you might be surprised at how different they taste. 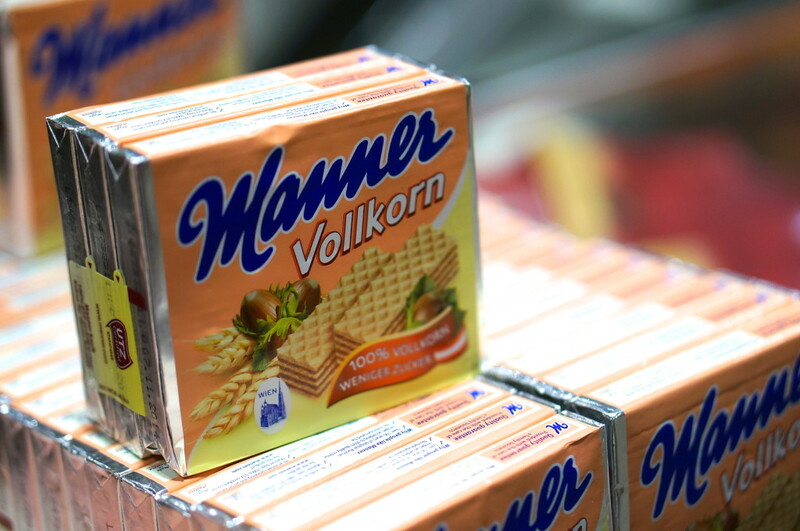 These delicate Manner wafer cookies have a long history in Austria— but aren’t widely available in the US. If you want to recreate the baked goods you had on vacation, but are daunted at the prospect of baking from scratch, pick up a packaged cake or bread mix. You’ll find mixes for soda bread in Ireland, sacher torte in Austria and cream cakes in Italy. You may not have the time to visit a local cheesemonger, but you can still find an excellent cheese selection in the supermarket’s deli section. In my experience, sampling is encouraged, so you can try before you buy. Some cheeses require refrigeration, while others don’t require any (or at least will survive a transatlantic flight) so make sure to ask before stockpiling. Vacuum sealed coffee and packaged teas are lightweight, spill-proof, and have a long shelf life, making them perfect items to bring home. 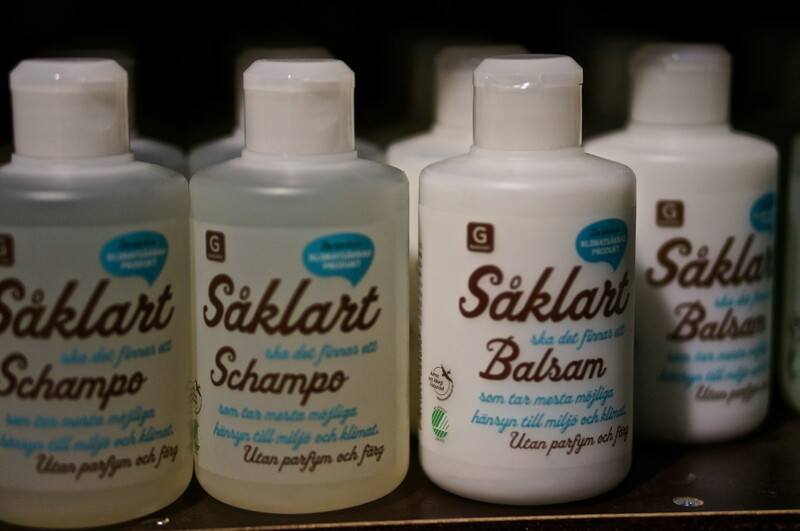 For non-edible souvenirs, look for the supermarket’s toiletry section. Here you’ll find everything from oversize soaps in Portugal, to herbal toothpaste in Italy, to luxurious facial creams in France. 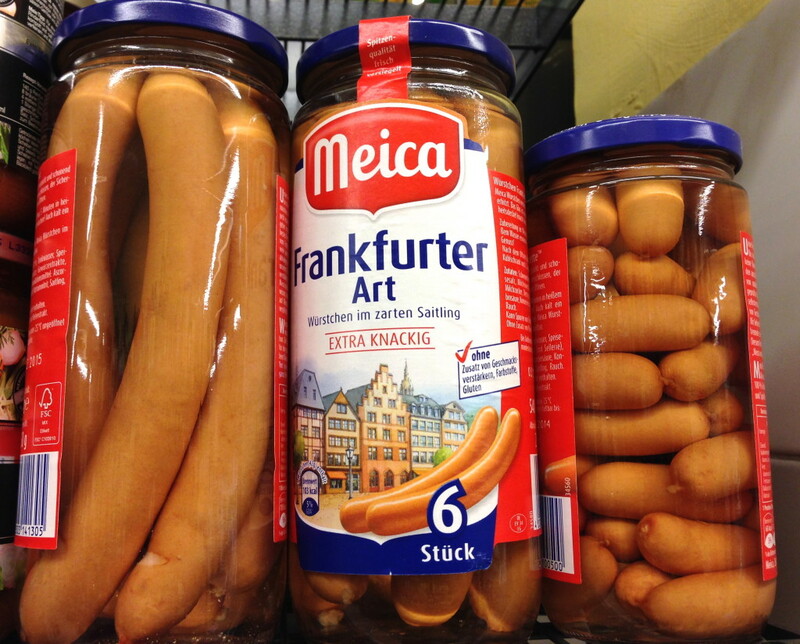 Although these frankfurters in a jar may look tempting, you can’t bring any meats or meat products back to the US. Fresh fruits and veggies will be confiscated. 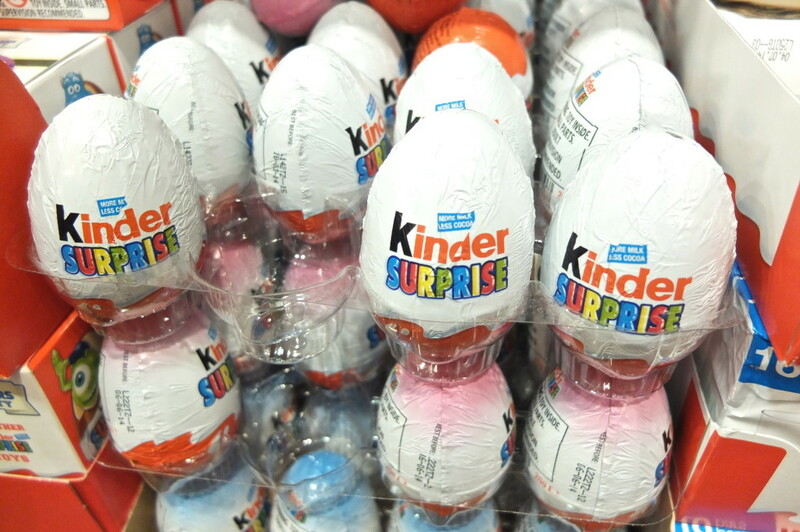 Bring these innocent-looking Kinder Surprise chocolate eggs into the US and you’ll get an even bigger surprise– you can be fined up to $2500 per egg. 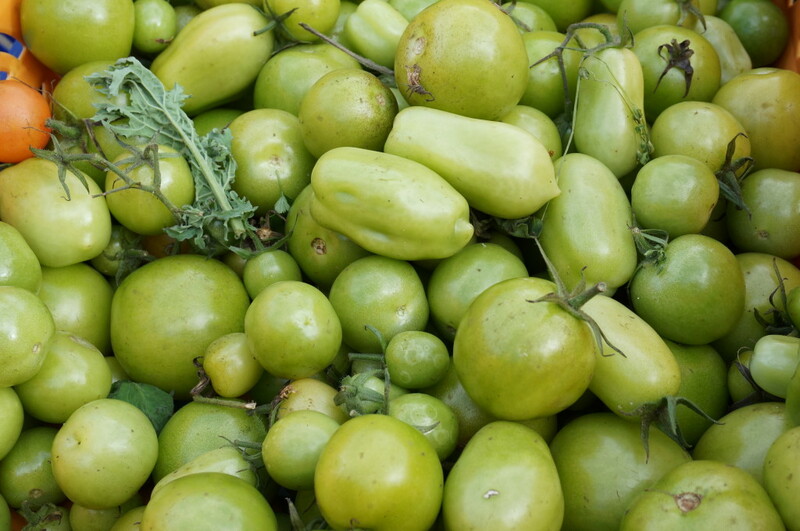 For translation assistance, recommendations on what to buy, or how to use a particular ingredient, don’t hesitate to ask for help from a local browsing the aisle. 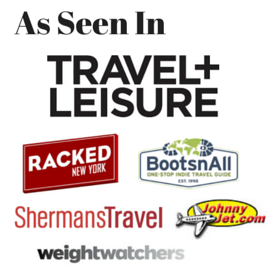 I found the locals I met in supermarkets to be extra helpful and friendly– they often filled my basket with their favorite items, gave me tips on using products, and even offered to email favorite recipes. What to buy: Jams, candy, cookies, baking mixes, toiletries, condiments, cheeses, soup and sauce mixes, tea and coffee all make great souvenirs. Where to get it: Try to find a “regular” supermarket, not a gourmet shop (though those can be fun too) or a made-for-tourist food specialty shop. In most cities, you can find these in any city center. In some cities (like London) you may have to do a little research to find a decent-sized, centrally located supermarket, or head a bit away from the center. What to know: To avoid any run-ins with US Customs, check labels carefully for meat-by products. What are your favorite supermarket souvenirs? Share in the comments! Chanel, it’s so fun too– the locals have literally come up to me when I’m looking bewildered and have given me such great advice on what to buy and what to make. They seem so pleased that I am so interested in their grocery items! Good point Sue, I hadn’t thought of that, I’ll have to add that to a packing post! Yup, can’t go wrong with candy– except when you accidentally buy black licorice! Is all cheese allowed through customs? I would think they wouldn’t allow unpasteurized varieties. ha thanks for the tip, I just checked it out! We had many items in common, glad to find another supermarket junkie! 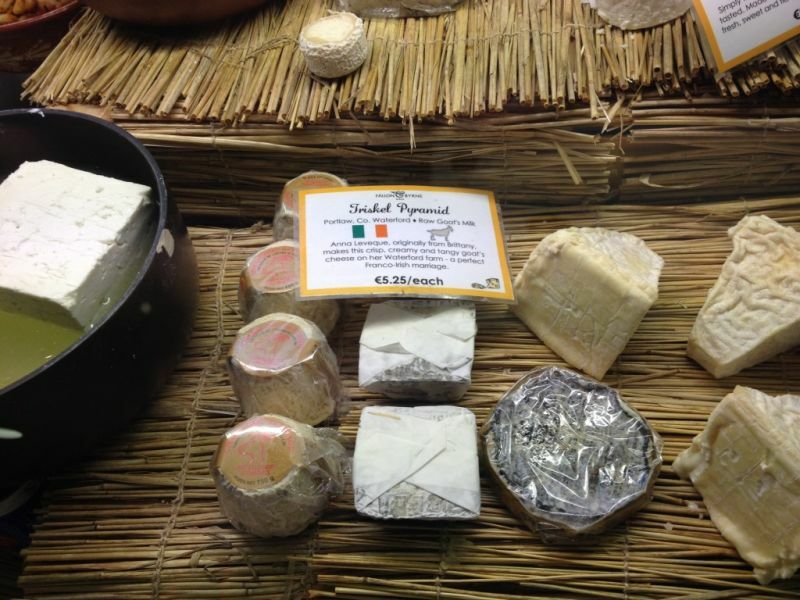 You can’t bring super runny cheeses as a carry on (liquid rules) and in theory you can’t bring upasteurized cheeses that haven’t been aged BUT can customs officials really read French? Not according to some famous celebrity chefs who’ve written about getting them through customs!! 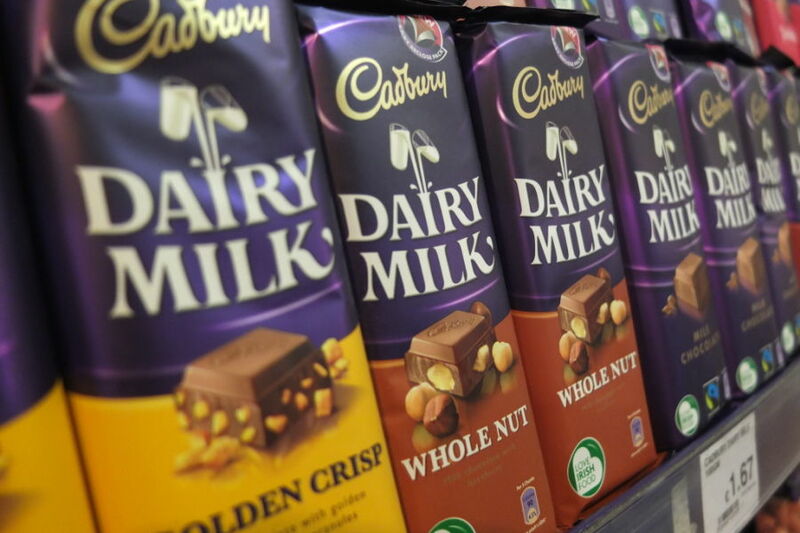 I love getting treats to take home from grocery stores – I always try to grab some chocolate bars or candy for friends! 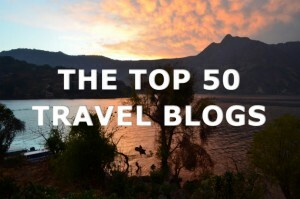 Thanks Alana– I also consider it my mission to taste test every country’s favorite candy bars! Thanks for the nice compliment! 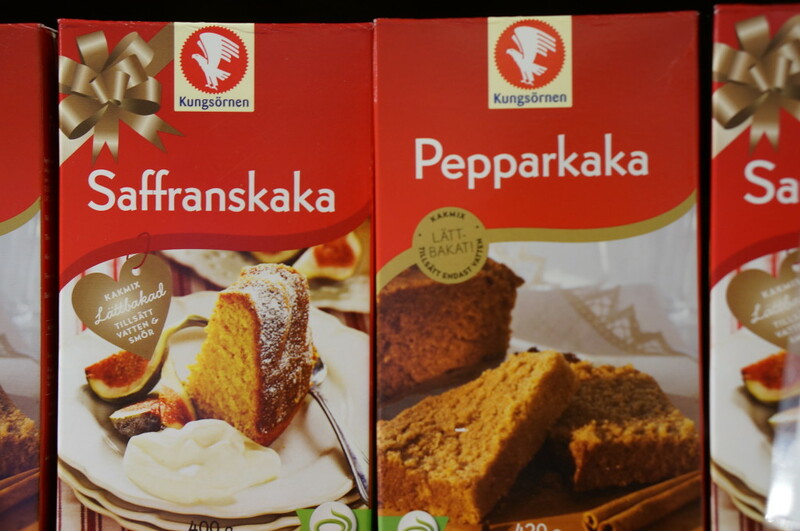 You can’t go wrong in any foreign supermarket, people love getting this stuff as gifts!